For decades, as Haiti has weathered political upheavals, coups d’état, economic crises and natural catastrophes—including the devastating earthquake that killed more than 160,000 people in 2010—photographers have nurtured an enduring, and at times tense, relationship with the small Caribbean country. Haiti’s vibrant society, pulsating energy and stunning light, combined with its tragic and violent history, consistently attract photographers of all ages and nationalities. Many of them are inspired by Alex Webb’s seminal work Under a Grudging Sun, which continues, to this day, to influence their aesthetics. 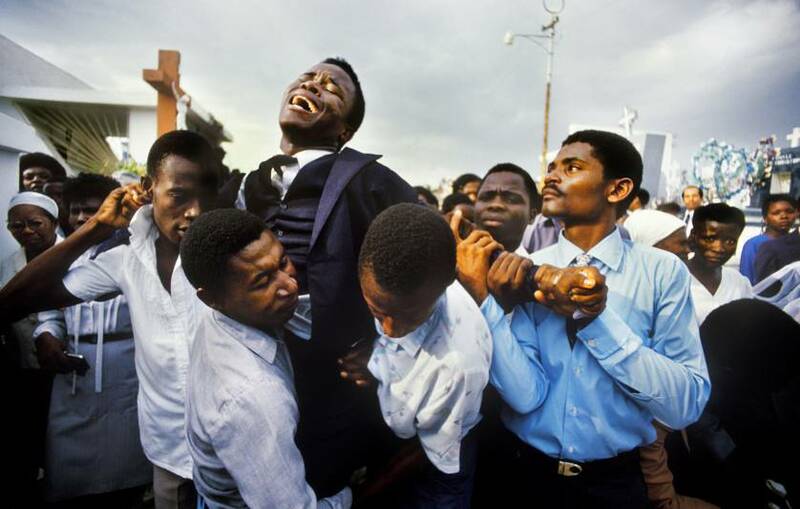 “I have this idea that Haiti chooses you,” echoes photographer Maggie Steber, who first visited the country 35 years ago. “If she doesn’t want you there, she will do everything in her power to make you run screaming for the next plane out of there. But if she likes you, if she recognizes in you a kindred spirit, she doesn’t let you go and she wrings your heart out every day. She uses you up.” Steber’s first experience with Haiti came when she moved to New York after living in Africa; she was missing living abroad and Sipa’s director Gökşin Sipahioğlu suggested that Haiti might satisfy that craving. She arrived just when President Jean-Claude Duvalier fell in a coup d’état. Together, these photographers and many of their contemporaries have shot, published and exhibited thousands of images of Haiti—many of them with the stated goal of contributing to the dialogue about this “complicated country that has had such a difficult and tragic history,” says Webb. And yet, five years after a 7.0-magnitude earthquake destroyed large parts of Haiti and brought unprecedented attention to the country with billions of dollars of aid pledged and hundreds of NGOs setting up operations there, the situation remains grim, calling into question the photographers’ roles. The deep connection many photographers feel when they first visit Haiti battles against the frustration many of them feel for a country that doesn’t seem to be able to escape its cruel fate. That’s a problem that hits home with photographers too. Though their goal is not the same as NGOs’, the nation’s poverty is ostensibly on display in their work, and they wrestle with how to show that world without harming the people in it. Photography that is not carefully considered can contribute, at times, to the reinforcement of stereotypes frequently applied to developing countries across the globe, from Africa to Latin America to Asia.